This thread is very interesting. I started mixing bands in '95 and records in '98. I build my own boxes now and I tend to build towards the dj aspect. It requires a lot of headroom on the subs, punchy and articulate mids, and pristine highs. However the system translates beautifully when I mix "organic" music (bands). A well deployed system is a well deployed system, whether it's playback or live. As both a dj and an audio engineer, I absolutely love a brilliant, impact-full sound system. And at the end of the day, mixing is mixing, art and science! 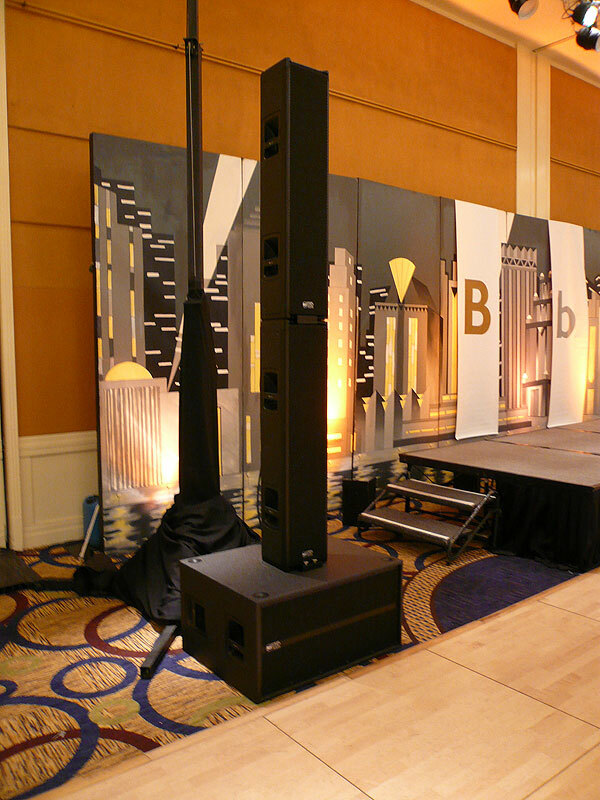 I'll be setting up a RCF TTL11A system for a dance event in Burlingame, CA this Thursday. If it performs up to expectation that night I'll have it running there all this weekend. Anyone interested in giving it a listen is welcome to call me for an appointment to get into the ballroom for a short time. I'll be working off & on at the event, so just leave a message if I don't answer when you call. Well, it has taken a while to get back to this post. The RCF TTL11A/TTS26A system worked out very well at the two events where I used it before I had to return the demo system. The first event was the one that I mentioned above, a 4 day & night long dance convention that topped 1600 in weekend attendance in a 20,000 sq ft room. I normally cover this room with 4 of my SLS LS8695 columns, two per side, along with 4 LA400 subs. I brought that system along with the plan that I would use the TTL11A only on Thursday night as that is the lightest attendance, then set up the SLS system for the rest of the weekend. As it turned out the RCFs exceeded my expectations, and at the height of the event on Thursday were performing strongly enough that I decided to leave them in place. The TTS26A subs offer the option of either a 30Hz or 45Hz highpass filter. I initially set it at 30Hz, noting that it performed fine at that setting, just an occasional flicker of the limit light with the system running as loud as I intended to use it. After a long day of loading in, setting up and then hanging in the ballroom to keep an eye on things, I turned in at 3am with the all night social dancing still going strong. The Burlingame Hyatt Regency is an atrium design building, with the grand ballroom being a concrete bunker below ground level, and the restaurant area above it. I was in a room 7 floors up on the opposite side of the hotel, and the pounding of those two subwoofers kept me awake until after 5am. The first thing I did on Friday morning was reset the highpass to 45Hz, which kept the rest of the hotel liveable. My SLS columns have always done a wonderful job covering these large ballrooms, but I had to devise my own base mounting system in order to angle them to minimize backslap from the far walls. The beam steering capability of the RCF TTL11A takes care of that for me. They basically let you dial in a setting for the height at which the column is placed and the distance to the far wall or back of your audience area, and the onboard processing will delay the signal to the individual amp channels, setting the vertical beam width and down angle needed. I expected this to create some ugliness in the sound quality, but was surprised to find that the process was transparent to my senses. The most important factor in my choice of this style of system is that I have to deliver engaging sound levels all the way to the farthest audience in these large rooms, yet people must be able to dance and interact directly in front of the main speakers. The SLS columns were excellent in this respect. While the RCF columns don't contain enough drivers to deliver line array performance like the SLS system, they ARE arranged so that as you move closer you are hit by much less than the full output of the column. At the height of social dancing on Saturday night, a hearing protection vendor at the event wandered the room with a meter. He measured peaks around 95 dB c-weighted at the edge of the dancefloor opposite the columns, and 105 dB directly in front of one of the columns. About 70 feet separated the two points of measurement. Overall I'm very impressed with the system's performance and ease of setup. I decided to buy one and expect delivery tomorrow. Here are some photos of the system setup, as well as several shots of the room to give you an idea of the size of the event. You'll see in one of the dance floor shots couples dancing right in front of the speakers.